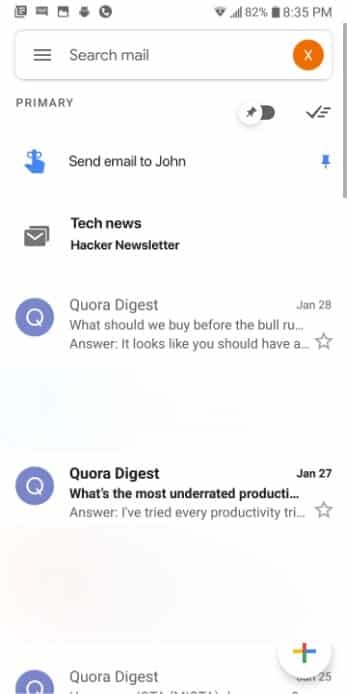 We all know very well that the tech giant Google is testing new features inspired by its Inbox app for its popular and most used email platform, of course, I am talking about its well-known application Gmail. Yes, according to the latest reports, the tech giant Google add these new features to its well-known email platform, of course, Gmail. The tech giant Google is testing new features inspired by its Inbox app for its popular and most used email platform, of course, I am talking about its well-known application Gmail. A future reinforcement and welcome to one of the most popular applications and services of the tech giant Google. With the announced end of Inbox, the tech giant Google’s email application that would never have the same popularity as Gmail, some of the services and features of the first one will gradually be integrated into the second one, of course, Gmail. The news was first detected and reported by a user on the well-known Reddit platform. There, the account manager moodio says that much of the features of the Inbox app and service will find a new home in the app of Gmail services. However, there is still much work to be done by the tech giant Google, its publication is accompanied by an illustrative image of the news. These will consist of new reminders, the presentation of publications and posted content, as well as bundles or packets of information. According to the same source, the tech giant Google will also take advantage of its Google I/O 2019 conference, starting on May 7 where it should also officially launch the latest features and functions of Gmail. Hence, now according to the latest reports, these features will now be tested on a version of Gmail for Android mobile devices and only a closed group of users will have access to the first beta versions. In short, soon we may have a new way to process large volumes or email categories. All of these are tools that are present in the Inbox app, which is business-oriented and will soon cease to exist. Fortunately, all its features will now reach the well-known Gmail for Android, iOS and Web mobile devices. So, what do you think about this? Simply share all your views and thoughts in the comment section below.